Travis Konecny scored two goals, to power the Flyers to a 4-3 win over the New York Rangers Thursday night in Philadelphia. The Blueshirts never led, and seemed as if they were playing catch-up all night. Oskar Lindblom and Jakub Voracek also scored for the Flyers, and Claude Giroux added three assists. The line of Chris Kreider-Mika Zibanejad-Jesper Fast continued its hot play of late; Fast scored two goals and added an assist for his first career three-point game. Zibanejad scored his 26th goal of the season, at the 13:53 mark of the 1st period, to tie the game 1-1. Kreider had an assist. Neal Pionk also had an assist; he now has 11 assists in 11 games with the team. Alexandar Georgiev got the start in goal and played well, stopping 32 of 36 shots. 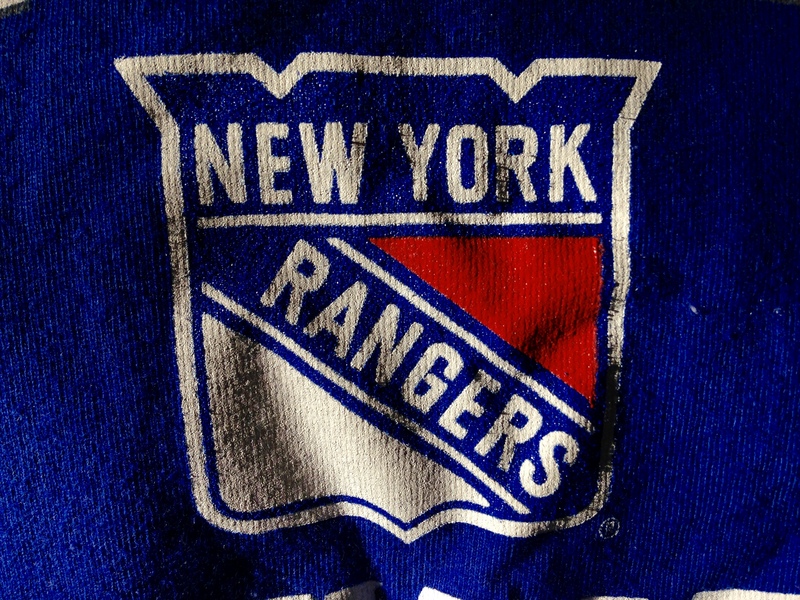 The Rangers [now 32-34-8, 72 pts] host the Buffalo Sabres Saturday night at The Garden. The Blue Jackets got a hat trick from Artemi Panerin and goals from Alexander Wennberg and Markus Nutivaara, and beat the Rangers Tuesday night at The Garden, 5-3, extending their winning streak to 9 games. The Blueshirts got a shorthand goal from Kevin Hayes in the 2nd period, and power play goals in the 3rd period from Mika Zibanejad and Chris Kreider. Zibanejad has a five-game point scoring streak [6G, 3A]. Henrik Lundqvist, starting for the first time since March 10th vs Florida, stopped 26 of 30 shots. Wennberg’s goal at the 14:05 mark of the 1st period gave Columbus a 1-0 lead. Panerin made it 2-0 midway through the 2nd period. But Hayes answered with a breakaway goal, beating Sergei Bobrovsky at 13:44, to make it 2-1. It was Hayes’ 21st of the season. In the 3rd, Nutivaara’s goal at 4:05 made it 3-1, but Zibanejad’s goal at 7:16 cut it to 3-2. It was his 25th goal of the season, and his 13th power play goal of 2017-18. Minutes later, Panerin put a rebound in at 11:19 to make it 4-2, after Lundqvist had stopped the initial Columbus shot but play was not blown dead. With 5:02 left, a scary moment for Rangers fans: Matt Calvert and John Gilmour both collided into Lundqvist, who flipped up in the air and landed hard, and was shaken up on the play. He remained in the game. 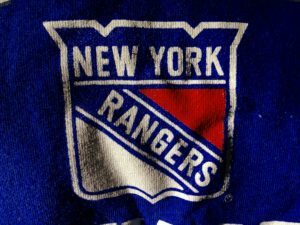 Kreider – with the Rangers net empty – deflected in a goal with 1:52 to play, to make it 4-3, but Panerin’s empty netter with :02 to play gave the game its 5-3 final score. Panerin now has 10 career goals against the Rangers. The Rangers [now 32-33-8, 72 pts] play the Flyers Thursday night in Philadelphia. Mika Zibanejad‘s goal 2:53 into overtime – the 100th goal of his NHL career – gave the Rangers a wild, 4-3, come-from-behind win over the Pittsburgh Penguins Wednesday night at The Garden. Zibanejad took a pass from Chris Kreider and snuck the puck past Pittsburgh goalie Casey DeSmith for his second goal of the game. Kreider had four points on the night for the first time in his career, on one goal and three assists. The Penguins, who led the game 2-0 after two periods, had been 22-0-1 this season when leading going into the 3rd period. 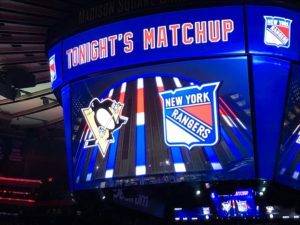 Rangers goalie Alexandar Georgiev stopped Evgeny Malkin on a penalty shot with 10.7 seconds to play in regulation, sending the game to overtime. Georgiev had been called for intentionally knocking the goal off its moorings. Georgiev made 37 saves in the win. After a scoreless 1st period, Pittsburgh scored two goals in a 55-second span early in the period on scores from Bryan Rust and Riley Sheahan to take a 2-0 lead. Kreider scored a powerplay goal 8:42 into the 3rd period to cut the Pittsburgh lead to 2-1, and Jesper Fast scored his career-best 11th goal of the season at 14:28 to tie the game 2-2. But former Blueshirt Carl Hagelin gave the Penguins a 3-2 lead just 73 seconds later. About a minute later, Kreider steamrolled toward the net and passed to Zibanejad, who scored a powerplay goal at 16:43 to tie the game, 3-3. The same combo would produce the game-winner in OT. Neal Pionk had three assists. The New York power play went 2 of 3. The Rangers [now 32-32-7, 71 pts] play the Blues in St. Louis Saturday night. John Gilmour‘s goal 1:22 into overtime gave the Rangers a 6-5 win over the Canucks Wednesday night in Vancouver. 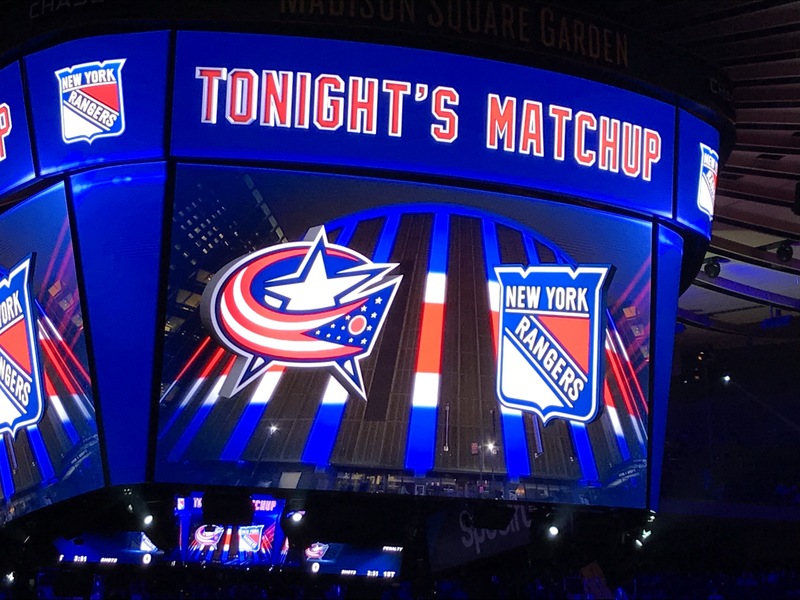 The win snapped a seven-game losing streak for the Blueshirts, during which time the team traded away a full quarter of its roster, including captain Ryan McDonagh, Rick Nash, and leading goal scorer Michael Grabner, in a shake-up just before the NHL trading deadline. Kevin Hayes scored twice for the Rangers, who also got goals from Jimmy Vesey, Mika Zibanejad, and new acquisition Vladislav Namestnikov: he scored on a breakaway 14:58 into the 2nd period. The Rangers allowed a season-high 55 shots on goal. The Blueshirts jumped out to a 3-0 lead in the 1st period, gave it all back by the midway point of the 2nd period, and then the teams traded goals. Brock Boeser‘s 29th of the season tied the game with 46 seconds to play, setting the stage for Gilmour’s heroics. Henrik Lundqvist made a season-high 50 saves in the win. Ryan Spooner had three assists. Bo Horvat had a goal and two assists to lead the Canucks. The Rangers [now 28-30-6, 62 pts] continue their West Coast road trip with a game against the Flames Friday night in Calgary.